CoolStance should be introduced gradually into the diet over a period of 10-14 days. It can be fed in a mixed feed with chaff and/or other grains and concentrates, or on its own. CoolStance can be wet-down to form a mash or it can be fed dry, provided that plenty of clean drinking water is also available (this enables the horse to regulate its intake of CoolStance and water). Feeding wet. CoolStance will absorb at least three times its own weight in water. For example place 1kg (2.2lb) CoolStance in a bucket and add 2 litres of water. Since CoolStance contains only low levels of sugar and starch (NSC), you can leave it soak for hours. Many horse owners prepare the evening feed after the morning feed. CoolStance must be fed in conjunction with additional roughage such as hay and/or pasture to ensure the horse obtains sufficient long fibre. If possible, split the horse's hard feed between 2 or 4 feeds per day. Feed CoolStance copra at the rate recommended, depending upon work or exercise levels. Feed medium quality grass hay or pasture to provide the remainder of the diet. Check there are no seed heads in the hay. Provide fresh, clean water away from the CoolStance feeder to ensure the horses leave the feed trough. This should be done for all feeds, as it will slow down the rate of eating and assist digestion. 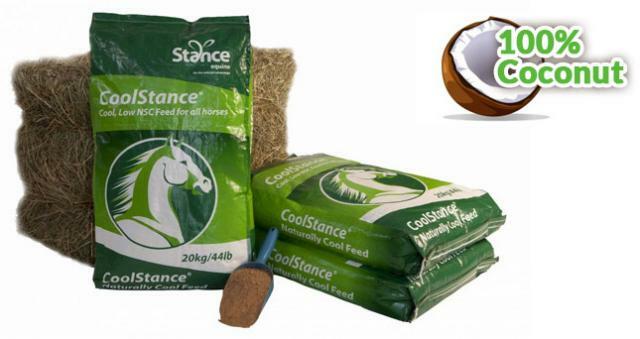 For most horses, CoolStance and hay will provide the required amounts of minerals and vitamins. *For yearlings and brood mares, a balanced mineral and vitamin supplement may be required. Horses were designed to eat little and often and usually graze for 16-18 hours per day. Feeding twice per day may cause "insulin spikes" which can predispose horses to insulin resistance. This can be avoided by feeding less and more often. If feeding more than twice per day is not practical, feed the hay in a hay feeder which limits the horse to eating the hay over several hours. For example, for a 500kg horse, feed 1kg CoolStance and 3 kg hay both morning and evening. Adjust the amount of CoolStance depending on the level of work. CoolStance® is brown because the white meat of the coconut has been heated during processing to extract the coconut oil.